HCFoo's Tennis Blog – Tennis Celebrity Photos, News, Gossip and More! 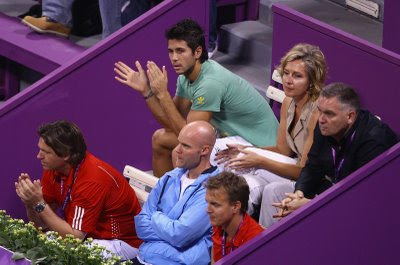 : Finally, Fernando Verdasco spotted in Doha; Anando confirmed couple! Finally, Fernando Verdasco spotted in Doha; Anando confirmed couple! Someone please tell me why Fernando Verdasco is not training for his Davis Cup final? Instead he is spotted (looking deliciously handsome) watching the match between girlfriend Ana Ivanovic and Jelena Jankovic at the Sony Ericsson Championships in Doha. Fans no longer have to guess whether something is going on between Verdasco and Ivanovic. He is spotted sitting side by side with Ivanovic's parents Dragana and Miroslav. However, sadly even the support from her parents and boyfriend couldn't help Ivanovic from stopping world no. 1 Jelena Jankovic. Jankovic wins the round-robin play 6-3, 6-4. In other results, Venus Williams defeated world no. 2 Dinara Safina 7-5, 6-3, while no. 9 Vera Zvonareva defeated Svetlana Kuznetsova 6-2, 6-3.